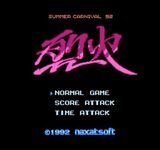 Recca, a vertical shmup for the Japanese Famicom, was released and sold exclusively during the 1992 Naxat Soft "Summer Carnival" video game competition. It is often called one of the best shooters for the system and one of the most technically impressive games for Nintendo's first home console. It is also considered extremely difficult due to the extreme speed and high number of enemies on screen at once. Because of its scarcity and perceived quality gameplay, Recca frequently sells for very high prices in the second hand market. A soundtrack CD is also available, which demands a high price as well.